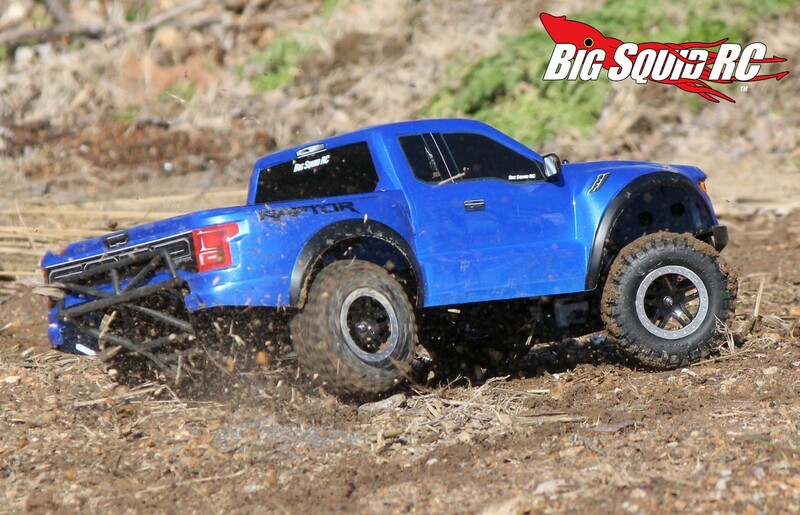 Traxxas 2017 Ford F-150 Raptor Review « Big Squid RC – RC Car and Truck News, Reviews, Videos, and More! What’s Needed To Complete: You won’t need a whole lot to get the Raptor up and going, just 4 AA cells for the transmitter. The truck comes completely built and packs a 7 cell NiMH battery & charger. Build Quality: We found our test truck to be very well built. One of the front shocks was slightly low on oil, otherwise we could find no faults with how it was assembled from the factory. Test Drivers: Robbie Da’ Gangsta, Mikeee Da’ Iron Stomached Outlaw, Sam Da’ Noobie, Tim Da’ Money, and me/myself/I. Test Venues: We got in a lot of trigger time with the Raptor. For track testing we used the RC Outlaws track in Collinsville Illinois. We used a Costco parking lot for on-road bashing and a half dozen local parks for general driving. Set-up Notes: We didn’t make any changes to the Raptor during the review period. 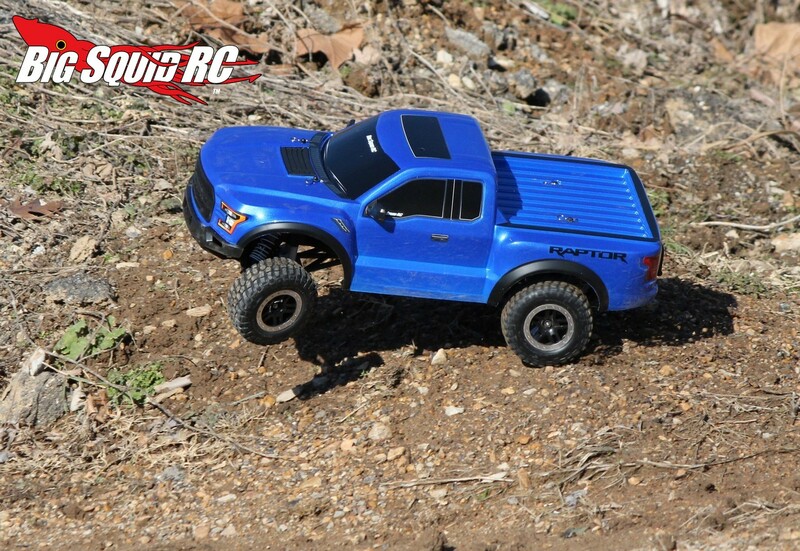 The Raptor was run bone stock, including the 7 cell NiMH battery. Our one variation from the box was skipping the included battery charger in favor of a Hitec RDX1. 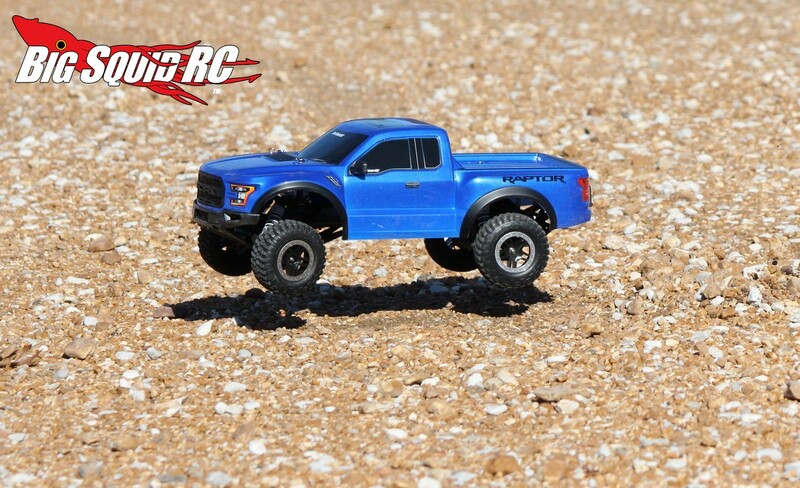 Turning: It might just be us, but the Raptor seemed a bit softer on front suspension than previous Slash based trucks. This lead to a truck where the front tires were nearly always firmly planted in the corners. While the front end was stuck like glue, the rear was on the loose side. For example, it wasn’t uncommon for the rear of the truck to break loose in both tight and sweeping corners. That isn’t saying that the Raptor is hard to corner, it is not, we are more saying that it rotates more freely than other trucks in its category. Jumping: We found the Raptor to be easy to jump. The Raptor tends to fly slightly “nose low”, but not so much as to be an issue. Also, just like every other 2wd “big bodied” truck on the market, it can exhibit parachute effect on windier days. Mostly, we found it soaked up jump faces like a champ and landed from reasonably sized jumps quite well. Bumps/Whoops: The long travel suspension on the Raptor did a solid job when the going got rough. 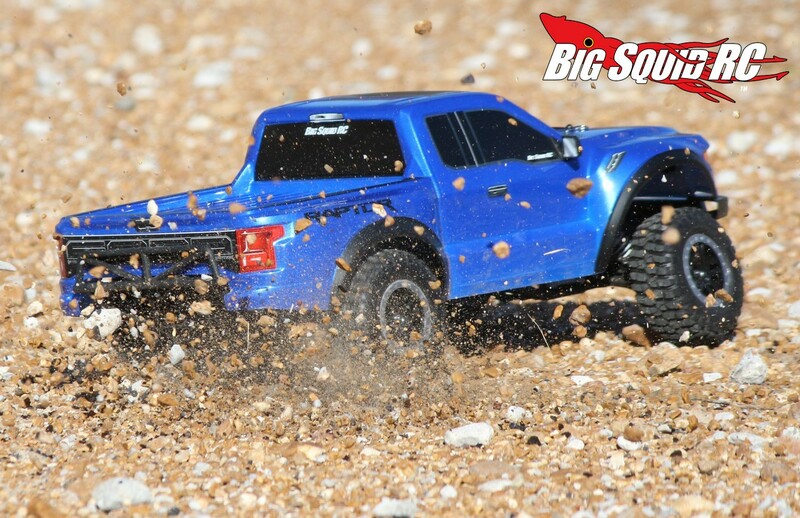 Once again we felt like the front end of the Raptor was softer than previous Slash based models, which gave it a bit more bounce than we expected, but still, the truck could soak up all sorts of ugly at speed. Smaller bumps were basically ignored while the truck soaked up big dirt clods impressively well. 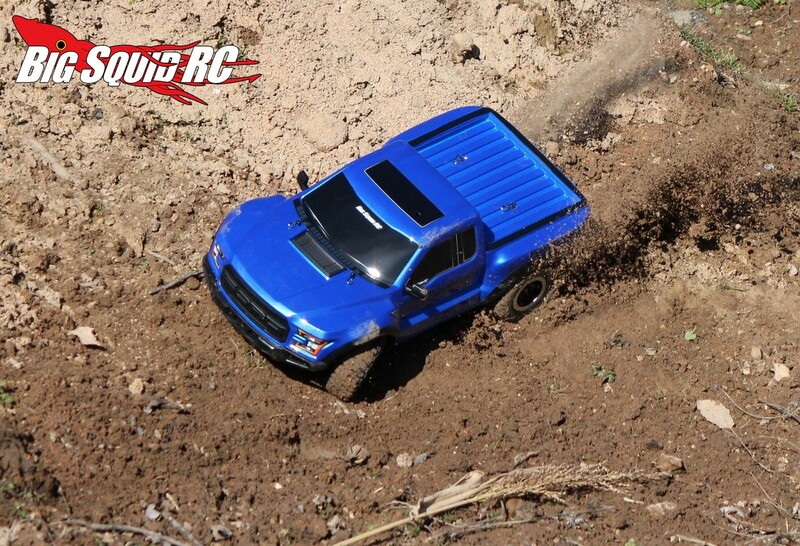 On-Road: We found that the Raptor had a lot of chassis lean when driven on-road. That isn’t necessarily a bad thing, it actually allowed the truck to find more traction on slippery/dusty pavement. Yes, the Raptor does traction roll from time to time in corners, but we generally had a blast while driving the Raptor on-road. 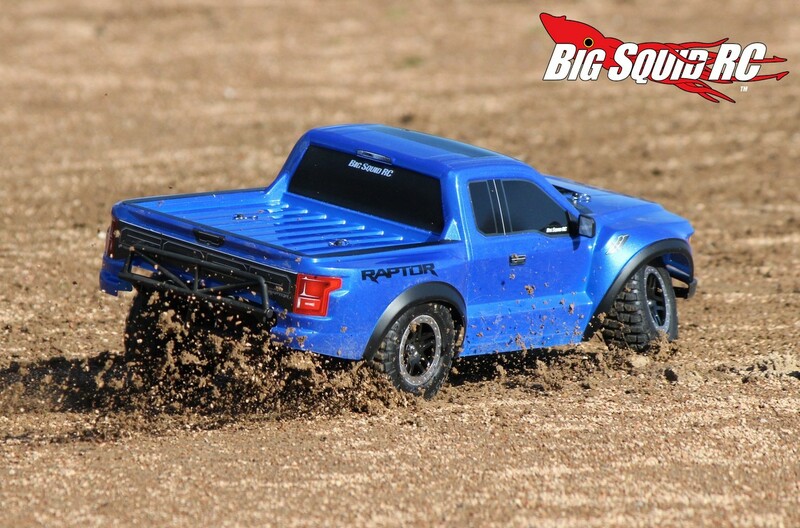 Grass: The Raptor gets around in grass quite well for a 2wd truck. 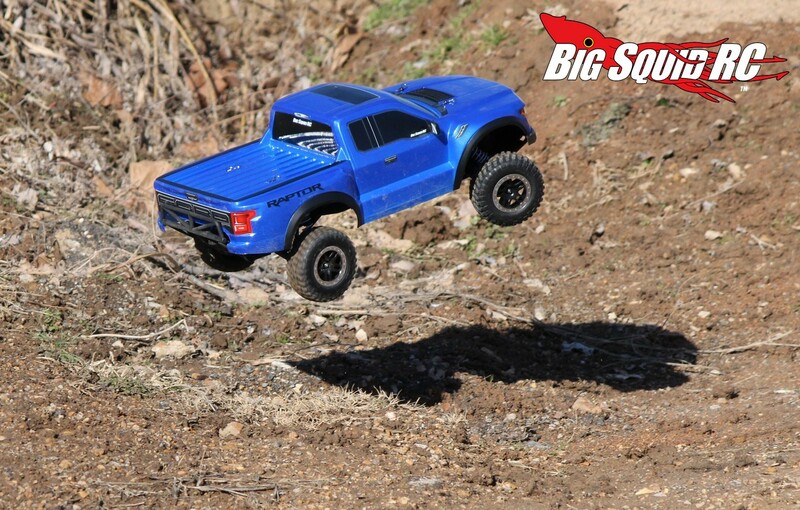 The chassis on the Raptor sits relatively high and its tires do an admirable job of finding traction. 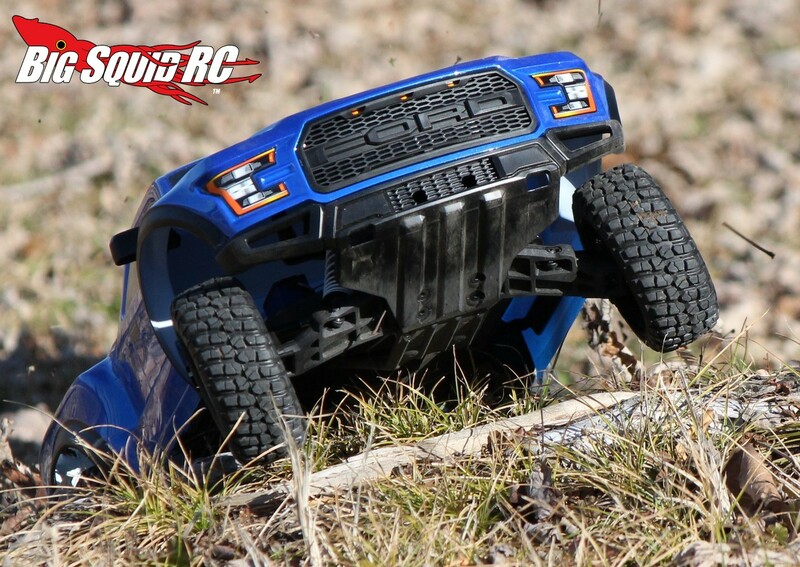 If part (or even most) of your bashing area consists of grass, you can definitely have a good time with the Traxxas. Tires: We were huge fans of the stock tires. They look absolutely incredible and they are soft enough to find plenty of grip on pavement, while still being hard enough to last a long time. The foam inside the tires isn’t too hard or too soft and the tires worked really well on an extremely wide variety of surfaces. Power: What can we say, the Raptor comes with a pretty standard brushed motor. Yes, it has enough spank to keep it interesting for long time drivers while not being too insane for first time noobs. Launching from a dead stop the truck can produce a decent size roost and its top end is fast enough to catch good sized air over jumps. No, it isn’t the fastest truck on the market, but its power plant is just about perfect for casual bashing. 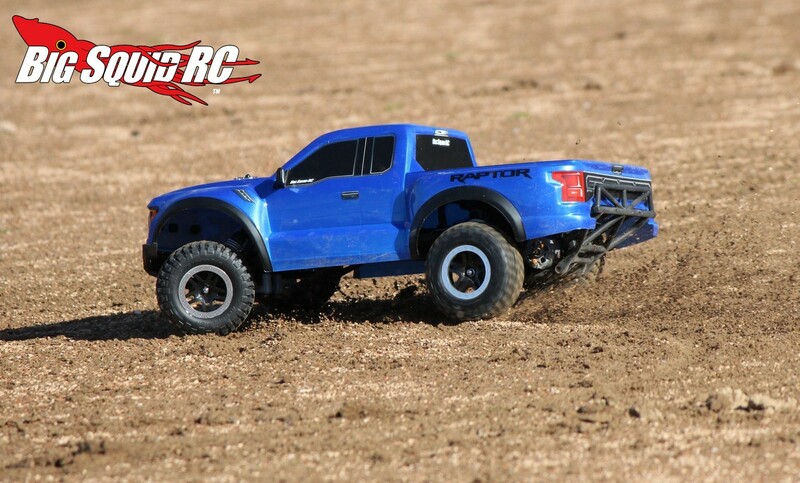 Radio: The included Traxxas TQ worked flawlessly for us. We had no range or glich issues and the ergonomics were in the ballpark for most of our test drivers. Broken Parts: We did a lot of beating on our test Raptor but didn’t break a lot of parts. The uber new from bumper is somewhat firmer than the one that comes on the Slash, but we were unable to break it. We did however manage to blow a spur, pop a shock cap, and snap a front hub, otherwise our test truck is still in great shape. The body on the Raptor is made from thicker material than usual and we found ours held up exceptionally well. Oh ya, the blue that our truck came in looked freak’n sweet. It would change hue slightly in different lighting, very nice. Ya know, external side mirrors are usually the first thing to break on a vehicle. That wasn’t the case on the Raptor. Both of our side mirrors are still in perfect shape. They are formed from a soft plastic that flexes easily without snapping. Should you be able to tear off the ones on your Raptor they are sold separately with part #5829. It might just be us, but the steering servo on the Raptor seemed faster than we remember. In fact, we would go so far as to say that the stock servo on our Raptor did a decent job. The Raptor comes with numerous injection molded plastic parts on its body- front bumper, grill, hood vent insert, and rear view mirrors. All the parts looked crisp, clean, and appropriately scaled. Best Mod: Metal shock caps, just trust us on this one. Time To Bash: B We didn’t have any problems getting the Raptor out of the box and bashing. Pop in four AAs, charge up the included NiMH, and you are ready to jam. Workability: B Simply stated, the Raptor is easy to work on. It has a nice open layout and comes with good quality hex hardware. 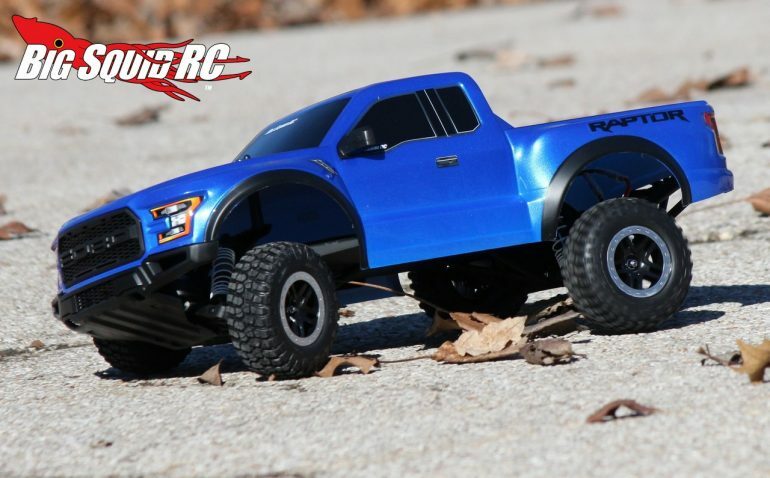 Car Show Rating: A The Raptor is the best looking Slash based truck yet. 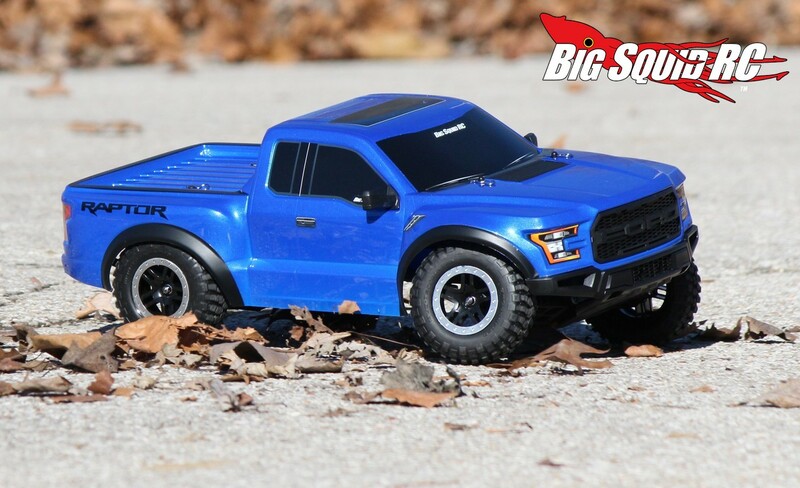 Its scale highlights, nicely proportioned body, and sharp looking wheel/tire combo make the Raptor quite the looker. Bash-A-Bility: B Drive any truck hard enough and it will break, luckily our Raptor took a lot of abuse with very few broken parts to show for it. Fun Factor: B Good handling along with enough brushed power to keep us interested made it easy for us to have a hoot while driving the Raptor. 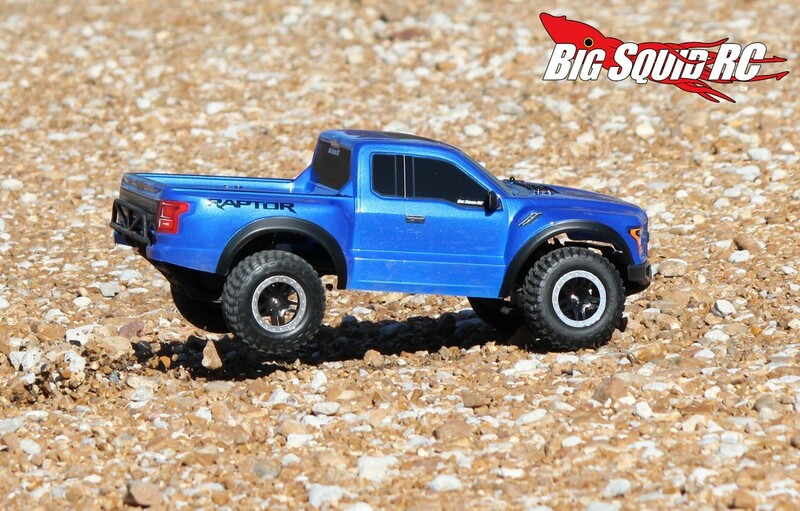 Handling: B While not the best handling truck in its class, the Raptor still handles well. 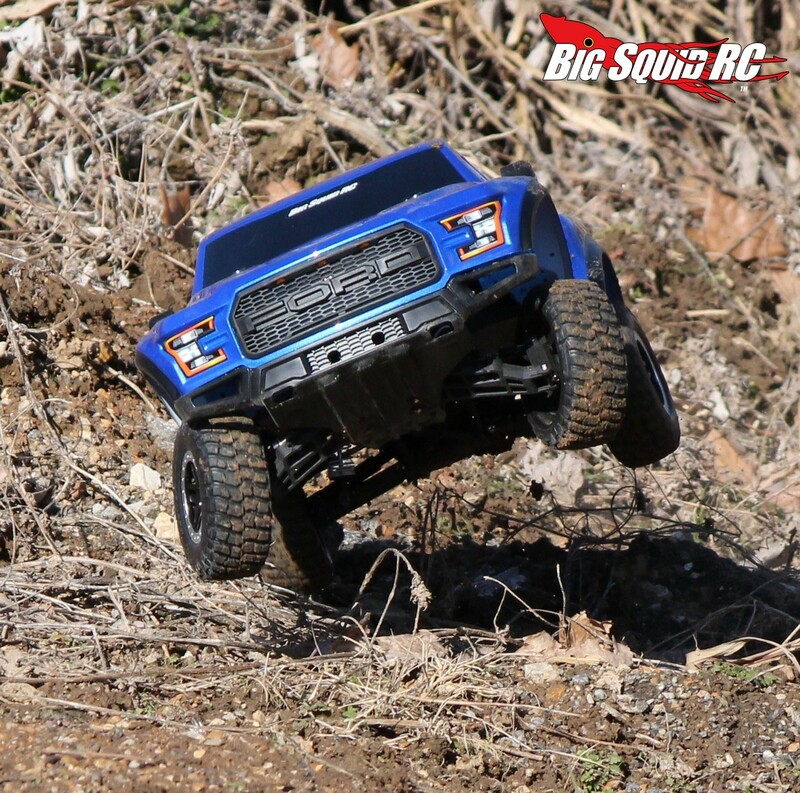 The Raptor has a lot of steering in the corners and can blow right over some pretty gnarly terrain. Value: B The Raptor’s $249 price point gives you a good handling truck that looks exceptionally sharp, we feel it is a solid value. Parts Availability: A Nobody beats Traxxas for availability of parts. 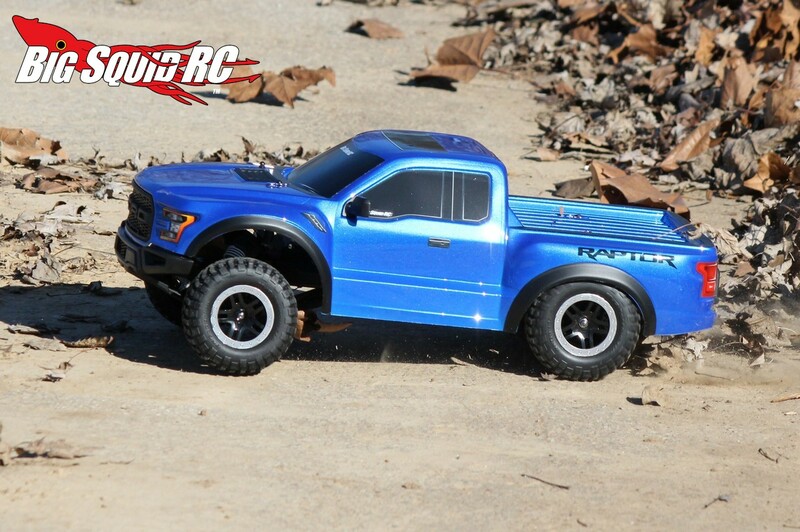 You can easily find many of the parts on the Raptor sitting right on the pegs at your LHS. 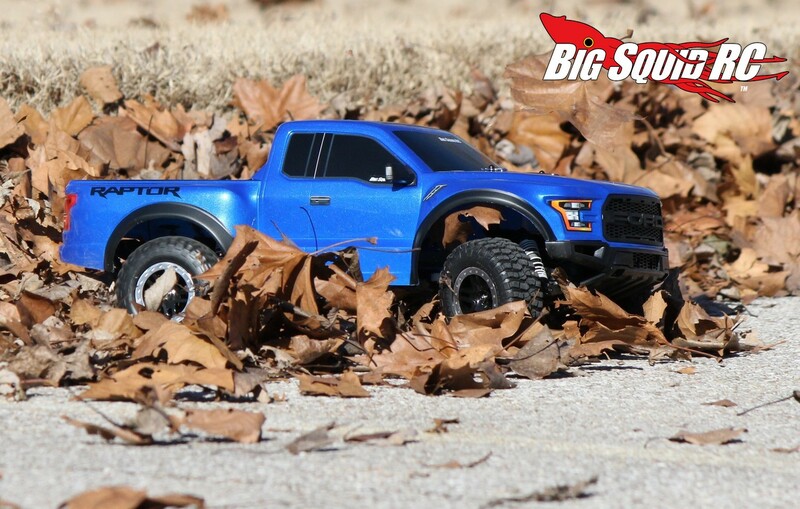 BigSquid Rating: B+ The Traxxas 2017 Ford Raptor makes a fantastic first truck or a great addition to your ever growing fleet. The Raptor turned heads with its looks and was a blast to bash around the local park. 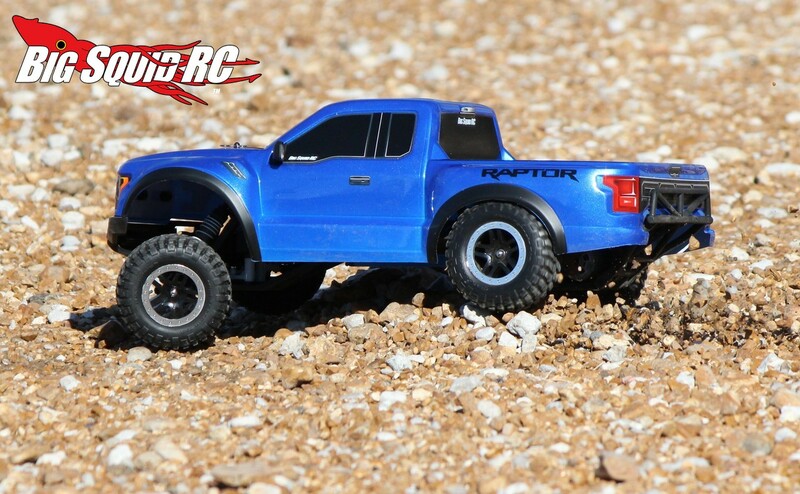 If you are looking for some good old fashioned bashing fun, we can highly recommend the Raptor to you.